The rose Brass Band is a floribunda rose that was first bred in the United States in 1993 by Jack Christensen who crossed a Gold Badge rose with an offspring from the rose Holy Toledo. For those of you who are not familiar with Jack Christensen, he is credited as being the youngest person to develop a rose that won the All-American award and he is also one of the pioneers of taking rose breeding online. To his credit he has well over 80 roses that he has bred and taken to market and he has been an independent breeder since 1987. 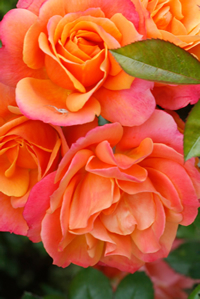 Brass Band roses got their name from their lush blooms that start off yellowish but then open up to a gorgeous blend of apricot and peach colors. Each bloom will average about 2.75" in diameter and they are quite full for their size, containing up to 40 petals each. They are actually quite striking flowers and unusual for their kind. The rose Brass Band has a mild, subtle damask fragrance and it tends to remain quite short, growing only around 3 feet or so tall. This beautiful rose is a repeat bloomer. The rose Brass Band is very versatile in the garden provided that you provide it with a location that gets full sun light, and it can also be grown quite successfully in containers on your porch or patio. All those blooms that it will produce over the season require a lot of sun light so make sure that you choose a spot that sees at least 6 to 8 hours each day of direct sun. If you can give it more, all the better. You also are going to want to find a location that gets good air circulation and has soil that drains well. Roses in general do not like standing water or soil that stays damp for long periods of time, and Brass Band roses are no different. Some varieties may survive, but they will be prone to many different diseases and pest infestations so try to find the rose Brass Band the right spot in your garden. If you are unsure about the quality of your soil, there are numerous ways to amend your soil and we will go over one of them in the next section under planting. Assuming that you have chosen the perfect spot for your rose Brass Band, you now have to get it in the ground. Before you do any digging, I highly recommend that you take a trip to your local garden center and pick up a bag of organic compost. Most places carry this stuff and it's usually inexpensive and it makes a great amendment to your soil. When you dig up the soil, mix it with the compost at a ratio of 2 parts soil to 1 part compost, then use this as your back fill. Now depending on how you purchased your Brass Band roses, you either got them as a bareroot plant, or in a 2 or 3 gallon container already established. If they came in a container then planting is very simple. Dig you hole about twice the diameter of the container, and equally as deep. This will ensure that the bud union maintains its current depth. 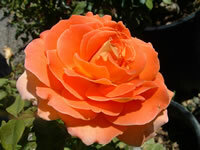 Simply plant your rose Brass Band, back fill with your new soil mix, and then water the loose soil thoroughly. That is all there is too it. If you ordered your Brass Band online then it probably came as a bareroot plant and planting these is not difficult either, but there are a couple of additional steps. To begin, you will need to dig a hole that is wide enough to fit all the roots that your rose came with. You also should dig it plenty deep enough so that you can mound up some soil in the center of the hole and keep the bud union about an inch or two below the surface once planted. Set your rose Brass Band in the hole on top of the mound and spread the roots outward angling down the mound, then back fill the hole only about halfway to begin with. Water the soil heavily until it is almost the consistency of mud, then back fill the rest of the way and give it one more good watering. What you are doing here is making sure that the soil has thoroughly covered the roots and no air pockets have formed. Taking care of your rose Brass Band is easy and if you have grown roses before you can follow basic guidelines that apply to most roses. Make sure that you provide enough water to your plant without overwatering. A good rule of thumb is usually one deep watering per week whether you do it yourself with the hose, or Mother Nature takes care of that for you. 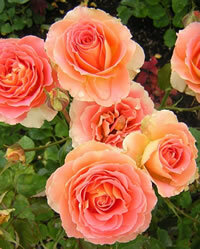 You can also feed your Brass Band roses in early spring with a good all-purpose granular fertilizer. I prefer to stay away from the liquid fertilizers as I've discovered they burn some varieties of roses very easily if not applied precisely. As this is a repeat bloomer, you can feed your rose Brass Band again when the first big bloom starts to form, and once more in the mid summer to encourage additional flushes. You can prune your rose Brass Band in early spring before the leaves start to form, just as you would any other shrub rose. Start off by removing any canes that are dead or look sickly or diseased, and dispose of them in the trash. This is also a good time to clean up any old leaves and debris from around the base of the plant. Never let decaying matter lay around your roses as this is an open invitation for pests and diseases. Next, cut back any lateral canes that overlap one another as these will compete for sun light once the leaves open up. Lastly, trim back the remaining canes about one third of their current height. If you live in a colder climate, you may have to prune them back about halfway.